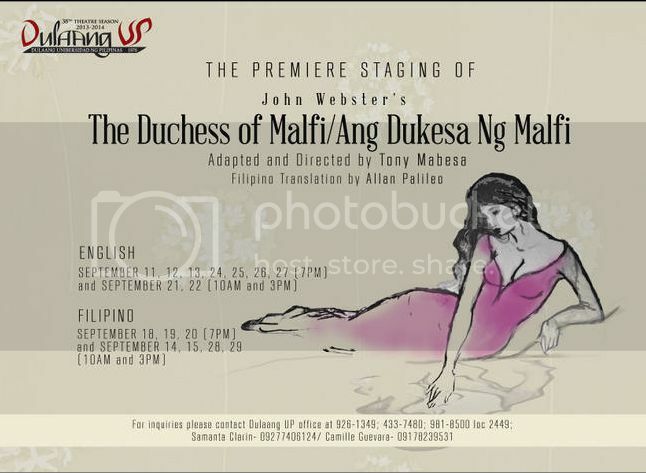 This September, Dulaang UP continues its tradition of bringing world classics to the Filipino audience through the first major Philippine production of John Webster’s The Duchess of Malfi. Dark and visceral, The Duchess of Malfi is widely held as the greatest of Webster’s works and the most gripping of the Jacobean tragedies. It has mesmerized and shocked audiences since it was first staged 400 years ago in 1613. The Duchess of Malfi is renowned for producing what could probably be theatre’s most compelling female protagonist and two of its most twisted villains. DUP’s production also features Ang Dukesa ng Malfi as translated into Filipino by Palanca awardee Allan Palileo. The play is adapted and directed by theater icon and DUP Founding Artistic Director Tony Mabesa, well known for his staging of world and Filipino classics. New York-based Obie award winner Clint Ramos and Eric Pineda collaborate for the set and costume design respectively; Choreography by Peter Alcedo, Jr., Lights design by Meliton Roxas, Jr., and Sound design by Jethro Joaquin. The cast is headlined by some of theater’s biggest stars and supported by some of its most promising actors. Banaue Miclat, Liza Dino, and Adriana Agcaoili alternate as the defiant Duchess. Richard Cunanan, Neil Ryan Sese, and George de Jesus take turns playing the twisted Bosola. The Duchess’ malevolent twin brother, Ferdinand, is given life by Jacques Borlaza and Allan Palileo. The corrupt Cardinal is played by Menggie Cobarrubias and Brian Tibayan. The production also stars Carlo Tarobal, Dax Alejandro, Issa Litton, Ces Aldaba, and the Dulaang UP ensemble. 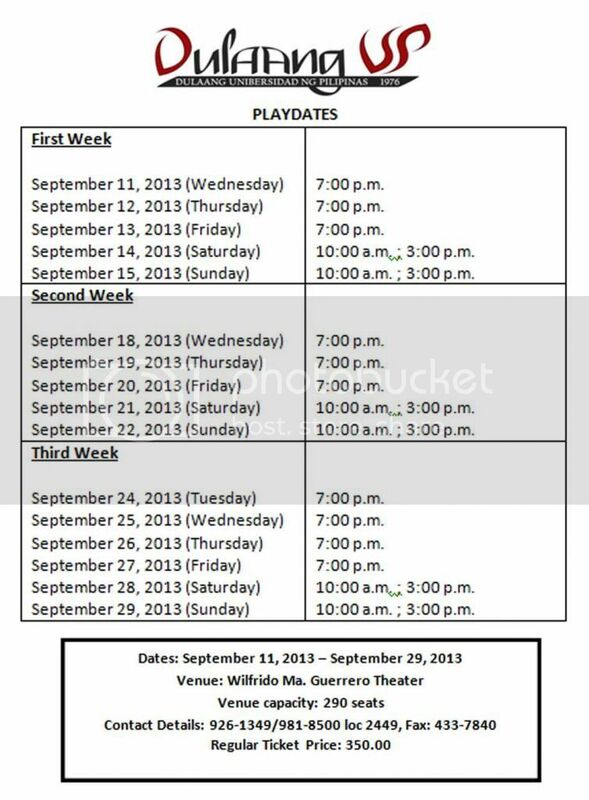 The Duchess of Malfi/Ang Dukesa ng Malfi runs September 11- 29, 2013 at the Wilfrido Ma. Guerrero Theater, Palma Hall, University of the Philippines Diliman. For sponsorship and ticket inquiries, please contact the Dulaang UP Office at 926-1349, 981-8500 local 2449 or 433-7840 and look for Ms. Camille Guevarra or Ms. Samanta Clarin.